Modonna recently broke ground on the Malawi Academy for Girls. A project of Raising Malawi, the nonprofit she co-founded in 2006 with Michael Berg, the school will host 450 teenage students from across the country. 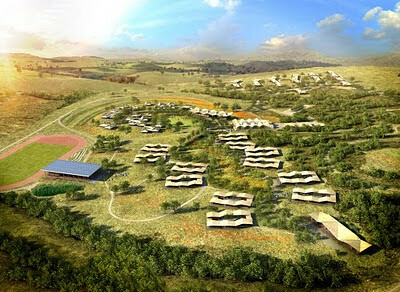 Based on designs by New York-based architect Markus Dochantschi, the school will feature open spaces and a campus that embraces the surrounding natural environment. Goals of the school include providing impoverished girls with the means to realize the full range of their potential, fostering Malawian cultural pride and responsibility, and to act as examples of girls' empowerment and gender equity.